A new device that relies on simple condensation to collect clean water from the atmosphere promises to provide up to 11 gallons of safe drinking water without an external power source, greenhouse gas emissions, or adverse environmental impacts. What’s more, the innovative Water Seer collection device could potentially run forever, gifting generations of people with access to ‘liquid gold’ in areas of the world where a harsh climate or lack of infrastructure make access to clean drinking water a major problem. Water Seer is powered by a simple wind turbine, and the device could easily be the first step toward a sustainable, enduring solution to water shortages around the world. 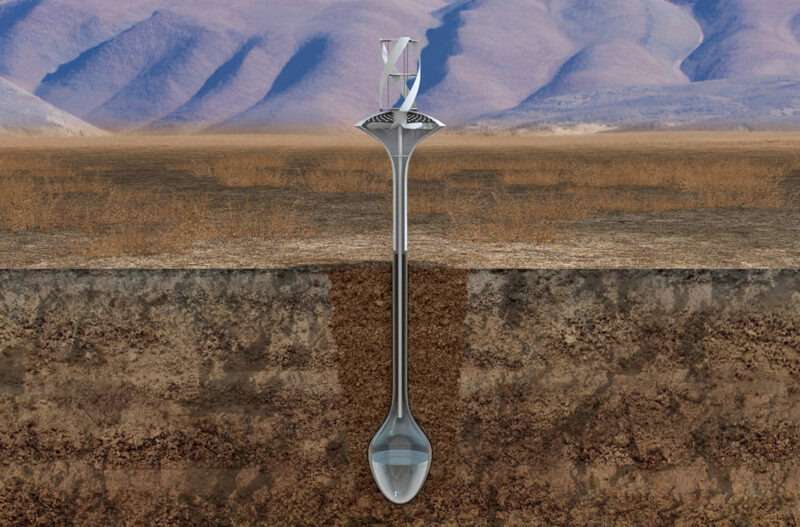 The Water Seer device is planted six or more feet into the ground, and soil is then packed around its metal neck. The top of the Water Seer holds a vertical wind turbine, which spins internal fan blades to draw air into the subterranean chamber. Because the underground chamber portion of the Water Seer is cooled by the surrounding earth, water condenses in the reservoir to creates sort of an artificial well, from which people can draw clean, safe drinking water around the clock. The low-cost device was developed by VICI-Labs, in partnership with UC Berkeley and the National Peace Corps Association, as a possible solution for the 2.3 million people on the planet who lack regular access to safe drinking water. A single Water Seer device can collect up to 11 gallons of clean water every day with no external power supply required, and a collection of several devices can provide enough water to support a small village. The not-for-profit company will match US purchases of each unit by donating a Water Seer collection device to those in need living in developing countries or in arid climates. Water Seer launched an Indiegogo campaign to raise $77,000 to build “orchards” of water collection devices around the world. The device has already been tested as a prototype, and the latest model was finalized in August 2016 and will undergo field tests with the National Peace Corps Association once the crowdfunding campaign closes. Our water table is dropping 17 feet/year, and our well is only a couple of years away from failing. The cost of a new well or of bringing in city water is close to $50K. This device is backed by creditable people. I'm willing to take the chance on purchasing and installing one to see how it works. I live in the high desert with lots of wind. If the pilot system works, I'll be glad to buy nine more to supply the water needs of my household. How much would one of these cost and when will they go in the market? NOTHING runs forever. Moving parts wear, having worked in Africa I have seen the plethora of NGO drilled water wells with India Mark II and III hand pumps. In my area of travel 2 out of 3 were not working do to lack of maintenance equipment and replacement parts. All models were designed for ease of pump maintenance but the down well parts though field maintainable they are inaccessible without a Service Rig to hoist the components to the surface. Focus on low tech folks that's what the developing world needs. I would like to buy one of these. Who do i contact for this? Where would I buy one of these fine contraptions? I am interested in having one for the farm. This is very intriguing. I would like to hear more information about what happens when the temperature is below freezing? What would the production of water be in the high desert areas? When this is in production, and you have a history of real world data, it would be a natural to market to the prepper community. The storage of enough water to last longer than a week is problematic. I would think, this could be a very popular item in the US, and of course that would allow more units to be placed where they are most needed. The inventors of a new water collection device dubbed Water Seer have launched a crowdfunding campaign to back this sustainable, low-cost source of clean, safe drinking water.